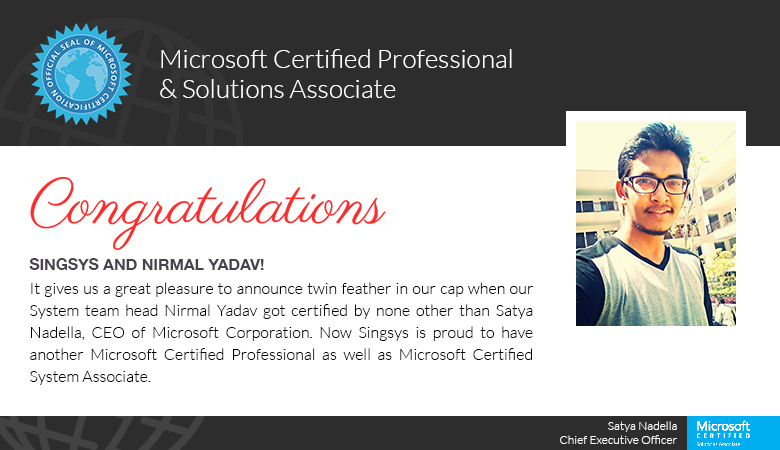 Nirmal Yadav has made Singsys honoured with dual certification of MCSA and MCP. These certificate will update his skills for troubleshooting Microsoft Windows Server 2012 infrastructure in all complex scenarios. This certification is hallmark of his skills which can be utilised to reduce company’s cost of doing business. Performance of the app is very crucial when it comes to building good user impression and branding. In case if a new user stumbles upon an issue it is highly unlikely that he will return soon or ever. Page load time of less than 2 sec can ensure delightful user experience that is error free which eventually guarantees high conversion rate. It is quite evident that iOS app development will continue to dominate the technology in all sphere of life in future as it is today. Smartphone users will grow from 4 billion users in last year to almost 5 billion users in 2017. Mobile app development will further grow into newer dimensions. In order to execute a new mobile development policy, a very strong and comprehensive understanding of latest trends emerging currently is required. Here i discuss key trends that are imperative to ensure quick and quality development in 2017.